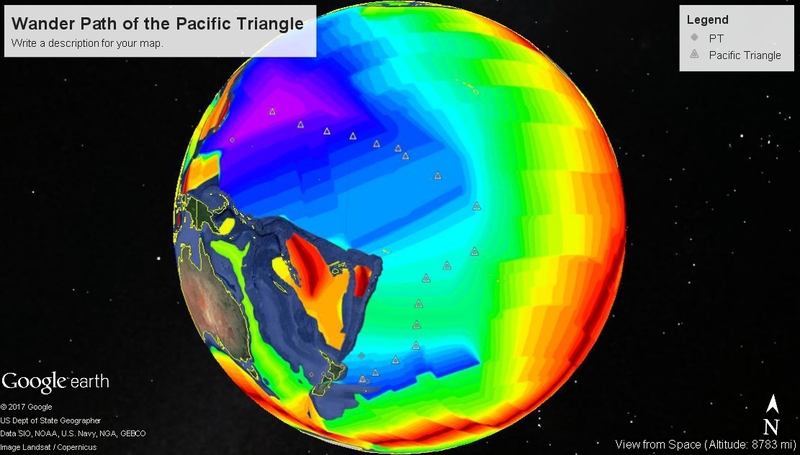 Essentially, the Pacific Triangle IS the Pacific Plate. 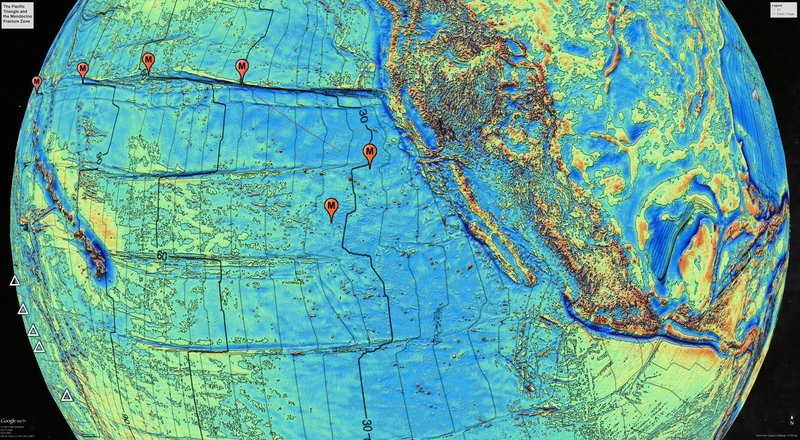 Unless you wish to consider it a sinkhole, a point subduction zone, all that we know as the Pacific Plate has grown out of this spot in the last 175 million years. 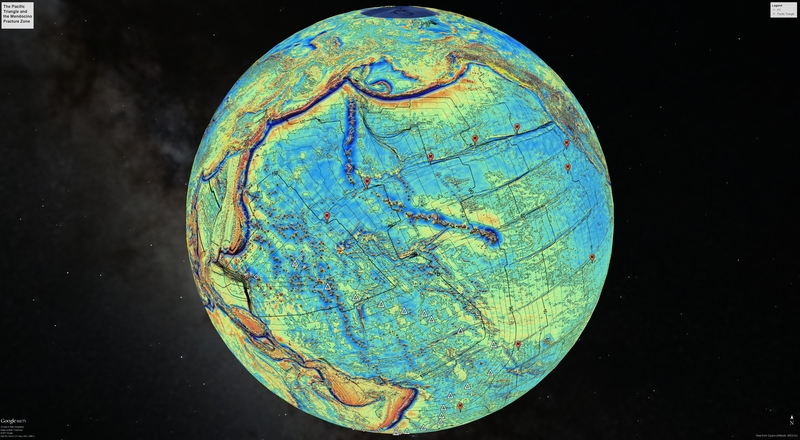 Seafloor isochrons are two dimensional space-time maps. Every point is also a clock, an increment of time when mid ocean ridge basalt (MORB) crystallized. Leaving aside questions of how the triangular form emerged, every isochron marks the position of the spreading ridge at that particular time. All points older than the isochron are hardened as part of the Pacific Plate, and all points younger do not yet exist as part of the plate. Christopher Scotese has developed an impressive series of maps as part of the Paleomap Project. These maps, and a Point Tracker utility make it possible to track any point back in time based on the assumptions of Euler rotations. 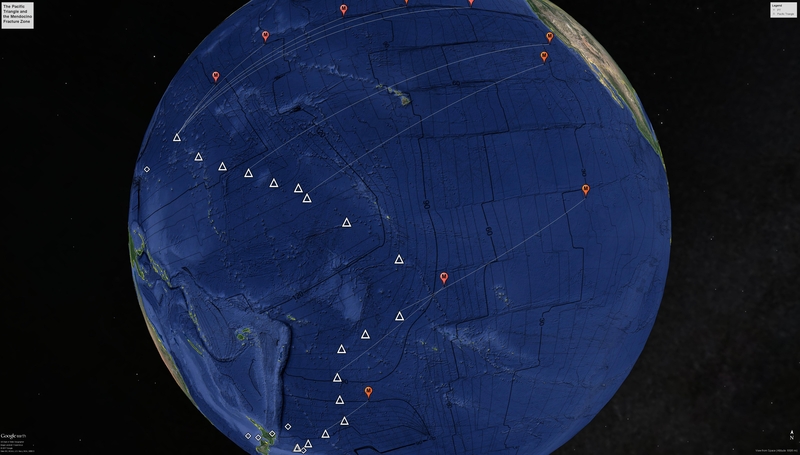 We decided it would be interesting to track the center of the Pacific Triangle back to the time of it’s origin. Wow, that beginning is 40 degrees south near current New Zealand. Uncertainties being large in these sorts of things, we thought it wise to check internal consistency. Visible in the southwest corner of the Pacific Triangle today, we plotted another point and traced its relationship. 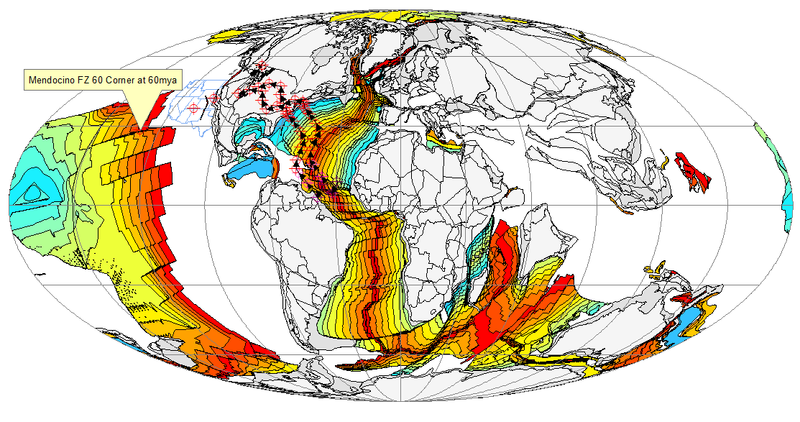 At 180mya, the southwest corner and the center of the Pacific Triangle are in the same place. At 170mya, the southwest corner moves away to the same distance as today, and tracks the center at the same separating distance thereafter. Test passed. The Mendocino Fracture Zone is arguably the longest single feature in the ocean floor. It currently extends from the edge of the continental shelf off Pt. Mendocino, California, some 4400 miles to at least the 165mya isochron near the current center of the Pacific Triangle. It manifests as a topographic feature, a gravity low, and a progressive offset in the isochrons. The “M” points along the top of the image are prominent corners in the isobars along Mendocino fracture zone where they have been offset. We then ran paleo locations for the isochron age at the corner. These can be seen as red M’s in the lower part of the image. The distances between the paleo centers of the Triangle and the paleo locations of the corners are always the same as today. Second test passed. Here is a zoomed out view on a gravity map. Scotese has incorporated this well on his Paleomaps. At the bottom left of this view, the position of the only slightly offset fracture zone corner can be seen. The view also shows the motion vectors of two corners of Colorado since 250mya, the current position of the US, and a raster of an alternate reconstruction by Ron Blakey for comparison. A more offset fracture zone corner can be seen in this view at 60mya. 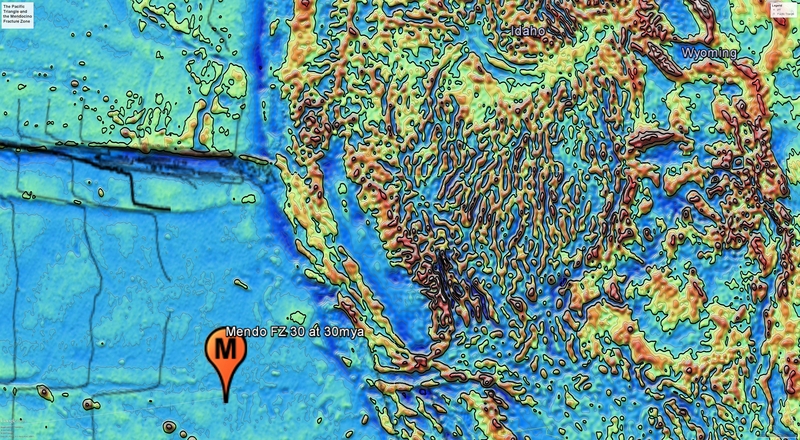 Was the Mendocino Fracture Zone generated in place by differential growth along the ridge, or was it a feature of the prior ocean floor that has vanished? 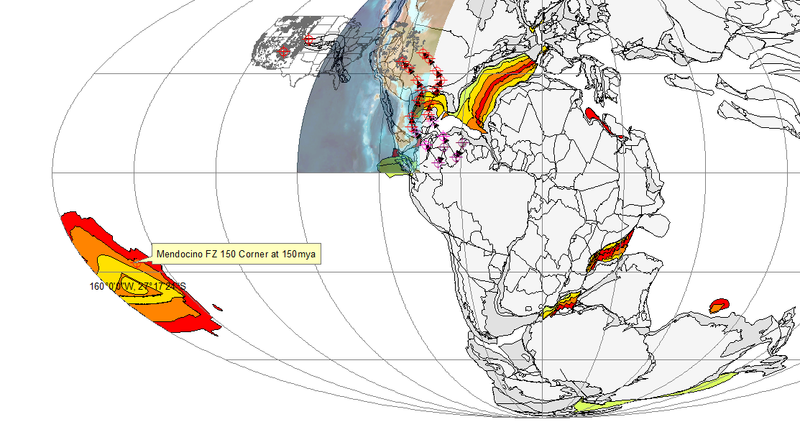 Interesting in this regard, the Sierra Batholith was largely emplaced in the 120 to 100mya time frame, and on the modern map the Sierra batholith and the Great Central Valley appear to be bounded by the Mendocino and Murray fracture zones. The unusual feature of the Transverse Ranges aligns with the Murray fracture on the modern map. If Scotese is correct, it was actually the Mendocino fracture that aligned with the transverse ranges 30mya. You have to try to imagine the upper Mendocino fracture and the heavy 30mya isochron slid down to the position of the red balloon. The red line got cut off, but it is the translation at 30mya. From top to bottom, the fractures are Mendocino, Murray, Molokai, and Clarion. The zone between them appears to define the strike slip/extensional regime, with subduction above and below. My intuition is that these fracture zones are prior features, and not merely generated in place during the growth of the Pacific Triangle. Well, Scotese has a consistent model, but is it right? The triangular form for the origin of the Pacific plate makes no tectonic sense, and the wander path is astonishing. There is another triangle in the Beaufort Sea, which according to Point Tracker has not moved at all in the last 150 million years. This entry was posted in Continental Wander Path, Geological Evolution of the Western United States, Seafloor Isochrons. Bookmark the permalink.